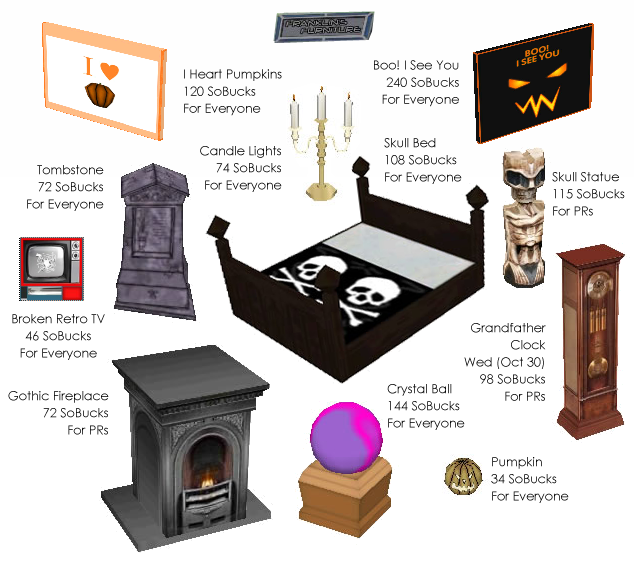 Treat yourself to a spook-tastic shopping spree with these Halloween items! 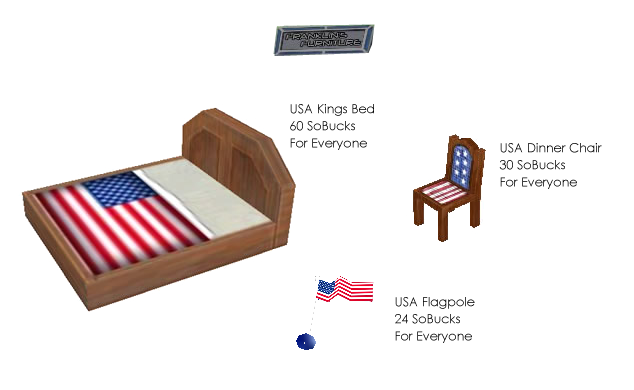 Below are the charts for each store (Trendiiz, Gee Cue, Franklin’s Furniture, Low-Mart). Items this weekend (from Saturday, October 25 to Monday, October 27) are mostly for Permanent Residents. 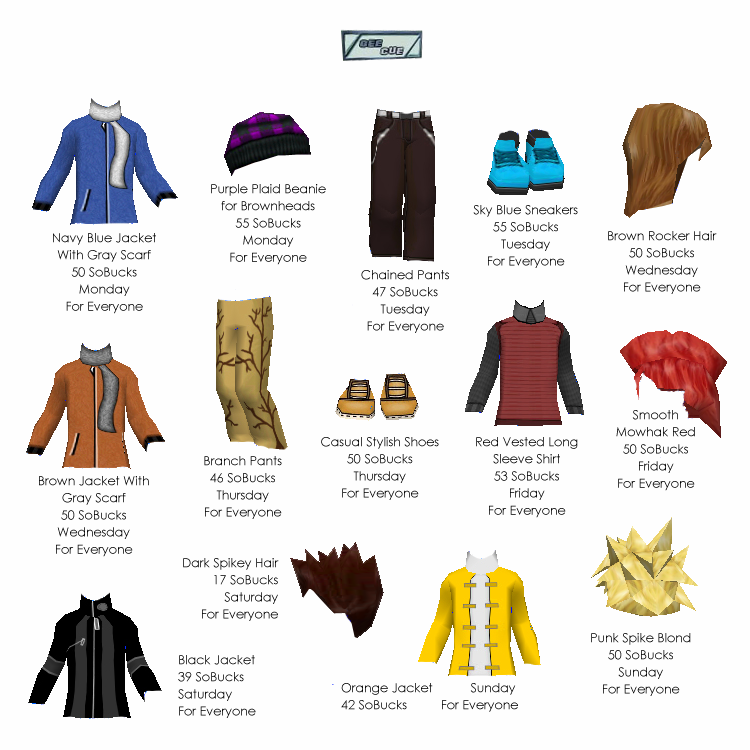 Items scheduled for October 27 to 31 are mostly for everyone. 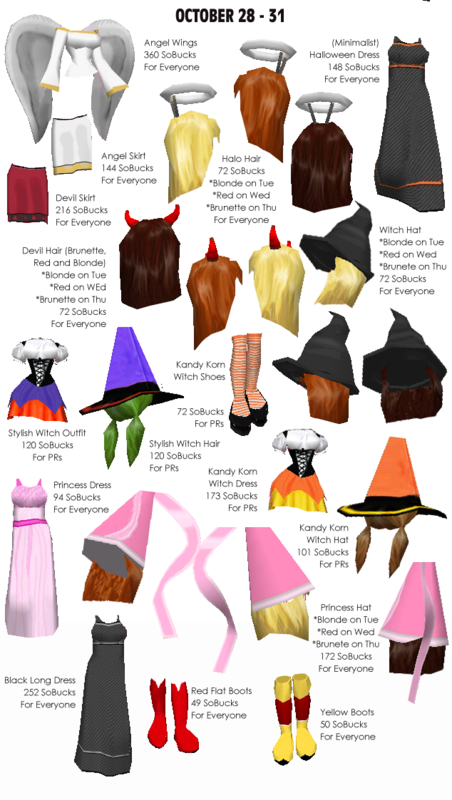 If you missed an item, don’t hesitate to request for it again; I will put it up again in the stores ASAP. If an item is out of stock, you can immediately send me a notice so I can restock it. 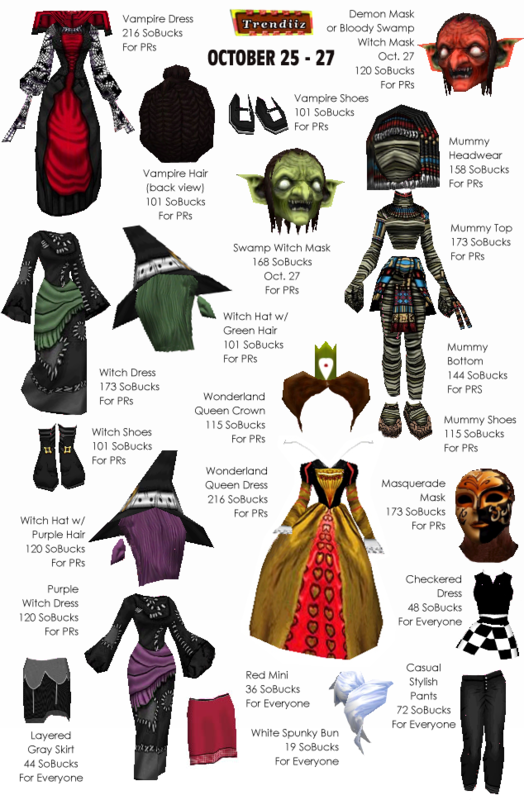 *The Purple Witch Dress has caused some store problems, so unfortunately it has to be removed from the store. Beautiful trench coats and blazers with scarves are featured in Trendiiz, Gee Cue and Low-Mart this week! If you want to look cozy, comfy and fashionable this Fall, you might want to drop by at these stores this week. Last week, we featured the Starry Night Walls. 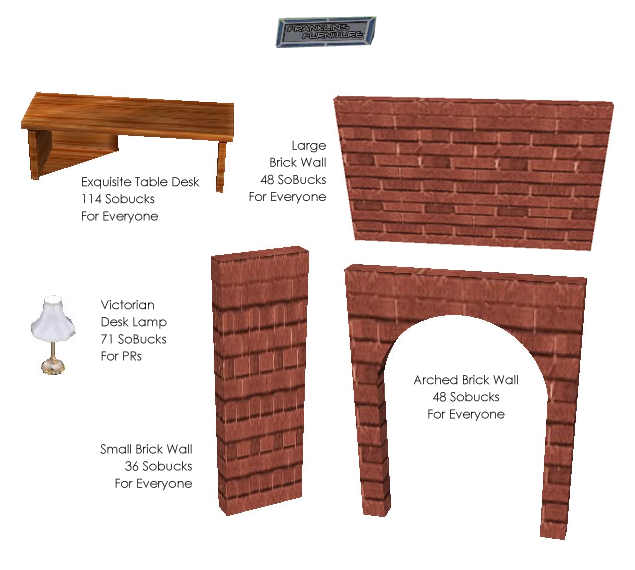 This time you can find the full set of the Bursting Sunshine Wall in Franklin’s Furniture! Add a bit of bursting joy in your room this week. 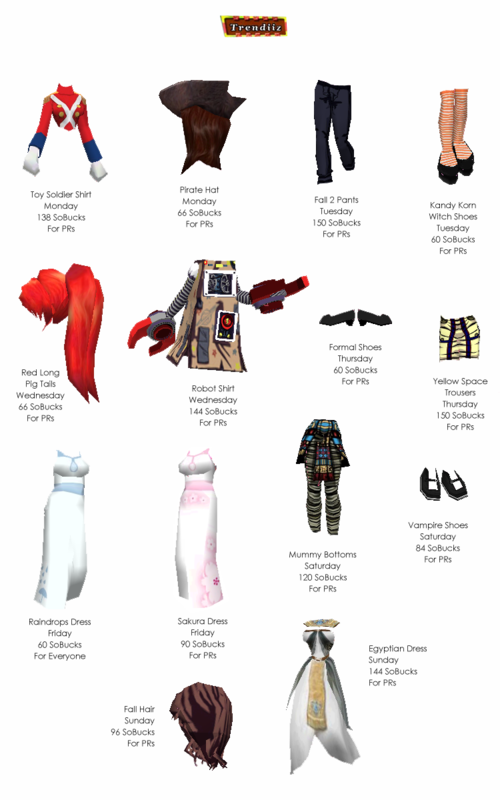 Click the images below if you want to see the charts in a bigger size. If you missed an item scheduled for Monday or Tuesday, come back the next day and the item will still be there. 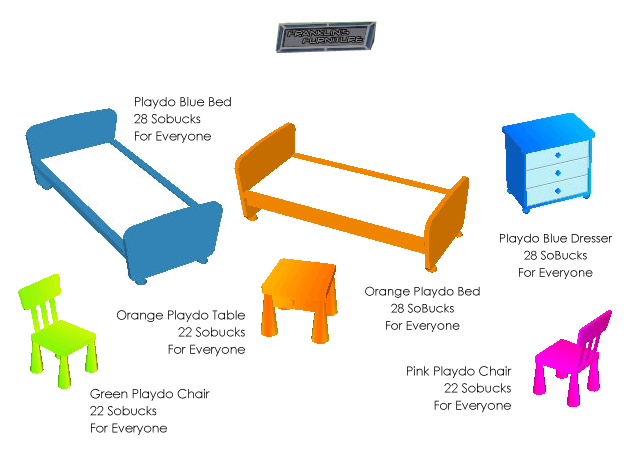 But since all the items follow a strict schedule, come back immediately and buy the item you want before it goes away. 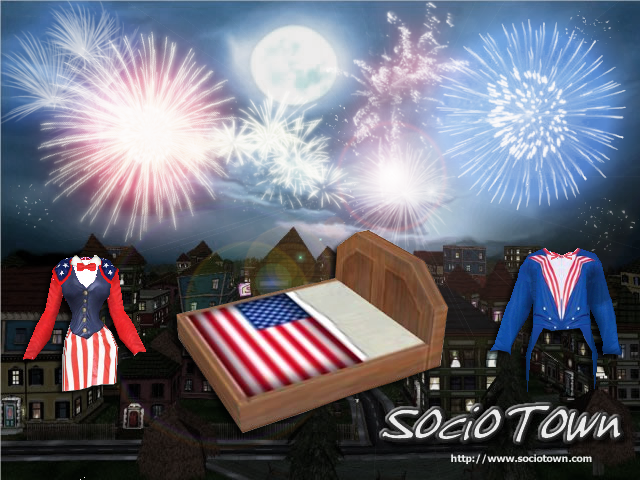 For requests, you can post a comment below or contact Dawn through SocioTown’s forum, Facebook page or in the game. Happy shopping! Fall continues to dazzle us with its colors and comforting chill. 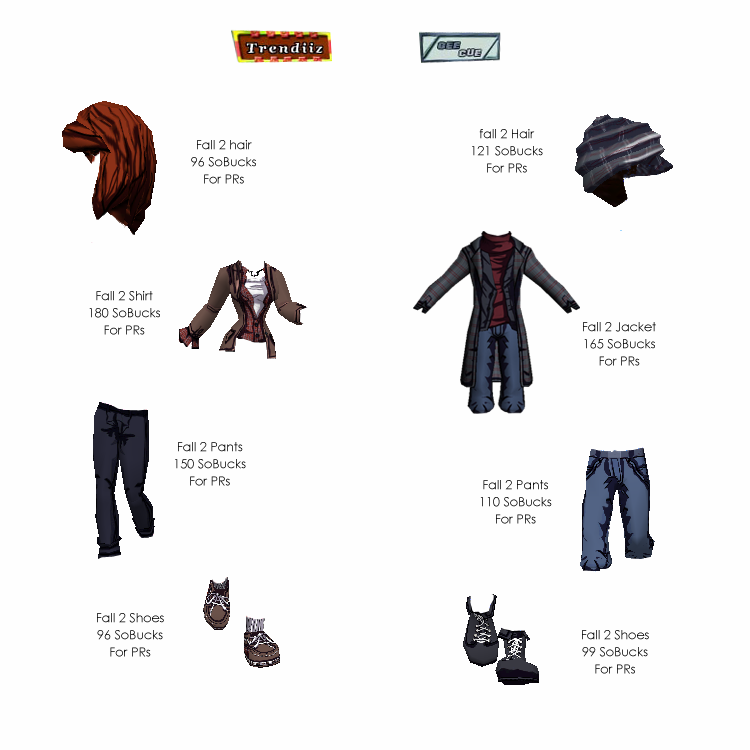 To go with the season, here is last year’s second set of Fall clothes. Now it’s your turn to dazzle everyone with your fashion sense! 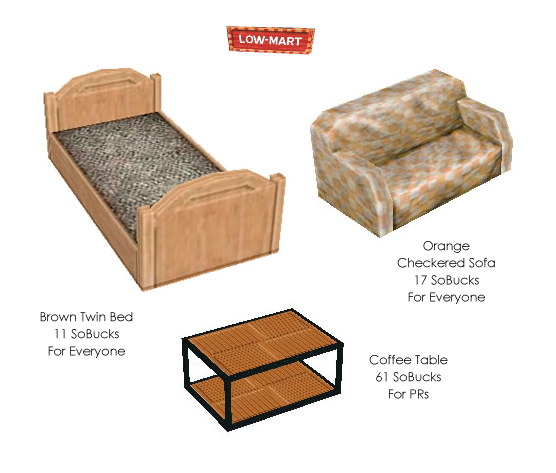 Low-Mart and Franklin’s Furniture are not behind, dazzling-wise. 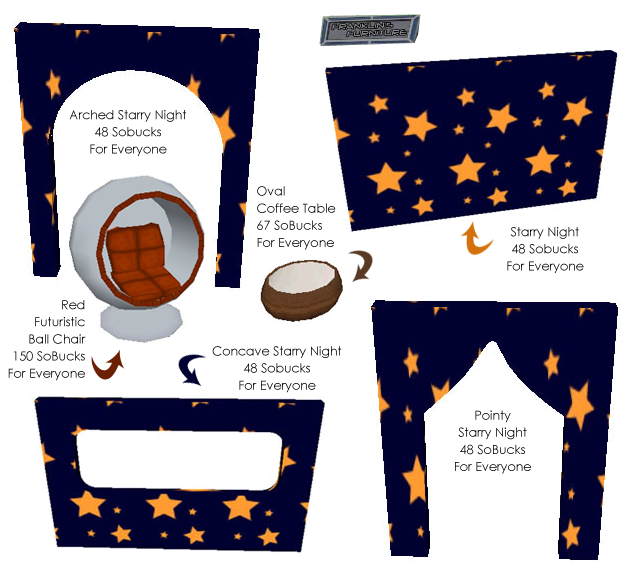 The Starry Night Walls are featured this weekend, so are some matching brownish furniture that compliment the current season. 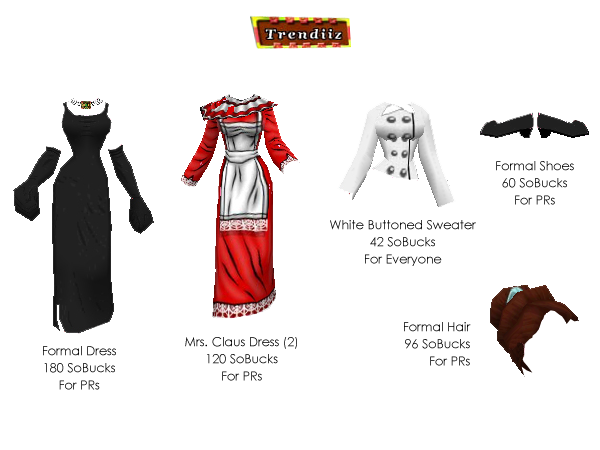 If the featured items are not to your liking, you can browse the rest of the store and check the numerous displays that change everyday. Happy shopping! 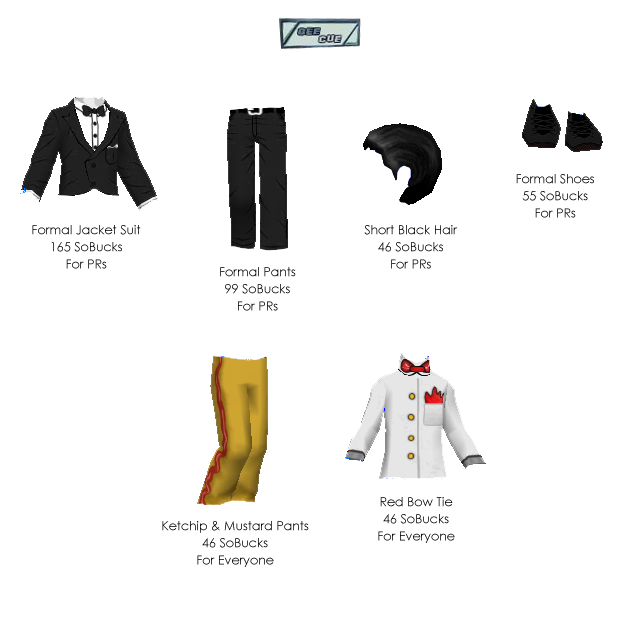 If you’re getting ready for school, let’s dress for the occasion at SocioTown, too! 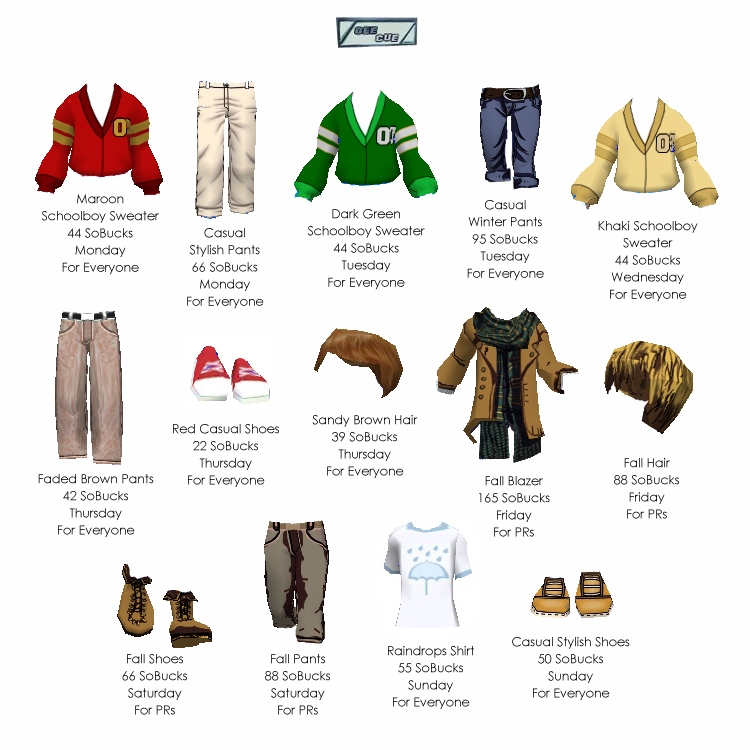 This week, you’ll find school uniforms, skirts, desk and lamp, and last year’s fall fashion set. Items at Trendiiz and Gee Cue are scheduled, while items at Frank’s and Low-Mart are not; items with no schedules can be bought any day of the week. 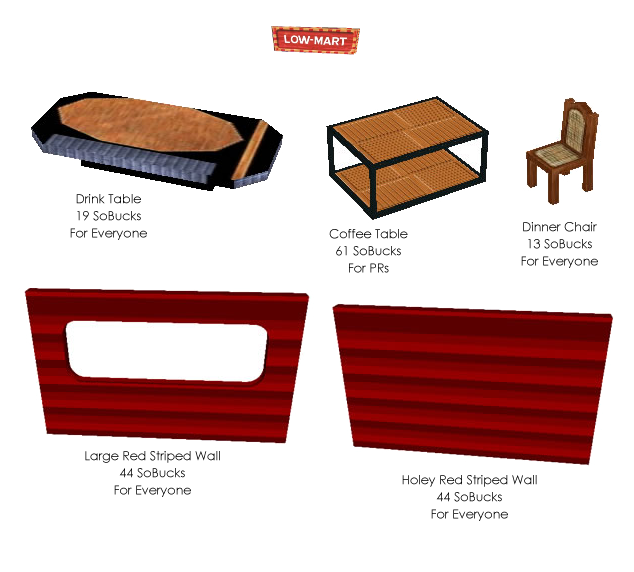 If you requested some items, you’ll find them scheduled around the weekend and some are at Low-Mart. 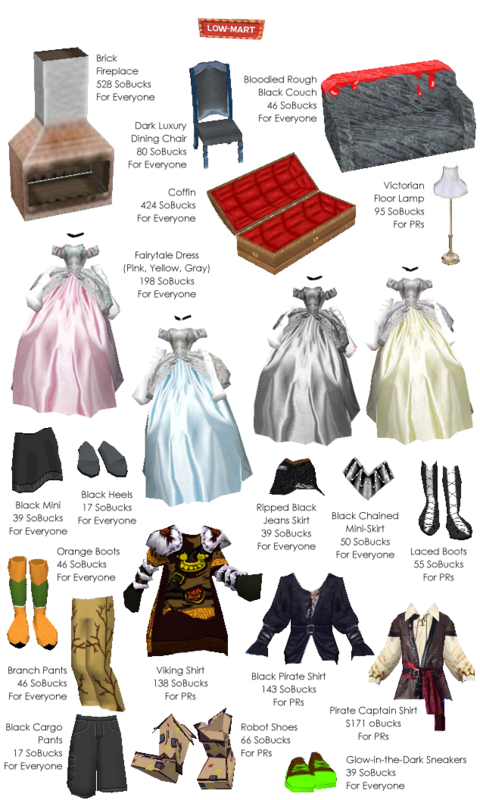 Click the images to see a bigger version of each list. Enjoy! We can make summer last forever here in SocioTown! 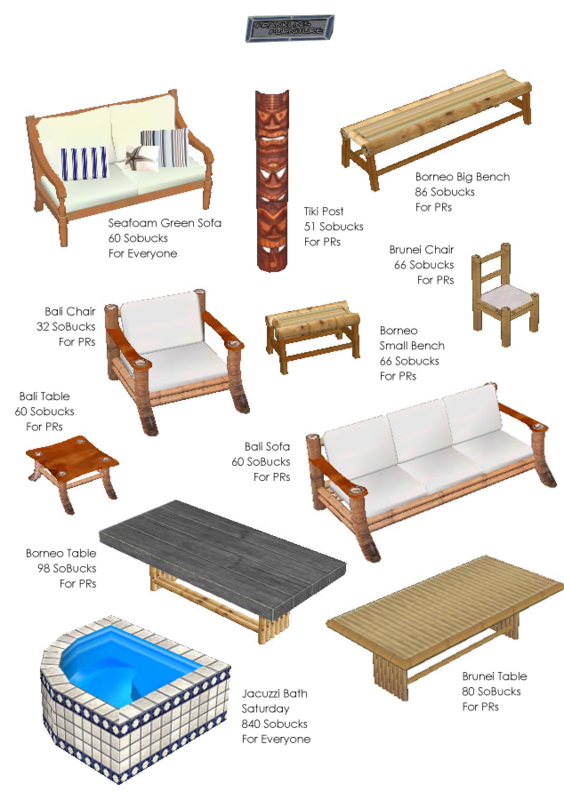 Enjoy two-piece bathing suits, sandals, visors, beach hats and tropical furniture this week. 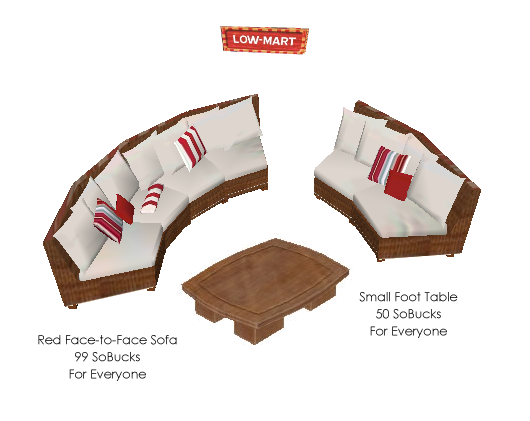 They are available for the entire week, so drop by Trendiiz, Gee Cue, Low-Mart and Franklin’s Furniture anytime you like! 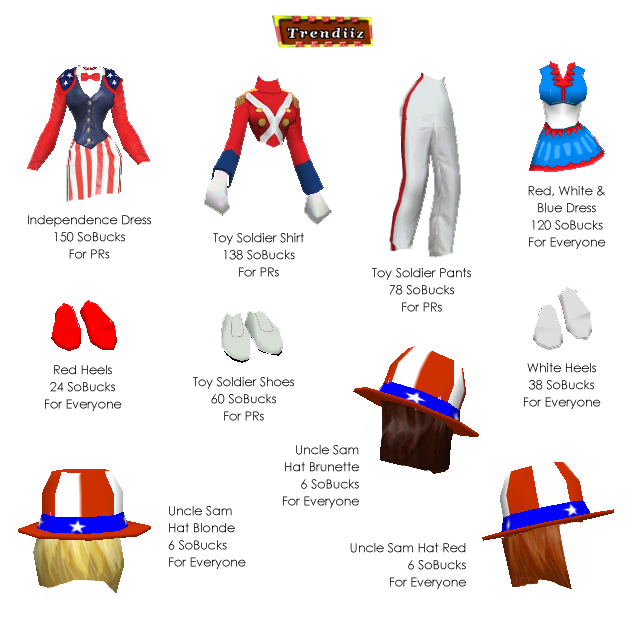 For those who are celebrating the Fourth of July later this week, drop by the store and grab some Independence Day themed items. Not celebrating? No prob! 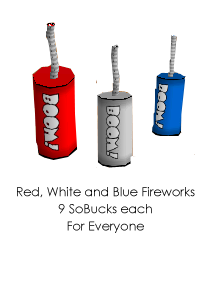 You can still have fun with Low-Mart’s special fireworks. How about hosting a dinner party this weekend? If you love having friends over at your apartment, try to spice things up by having a nice kitchen and dining area for a dinner party. 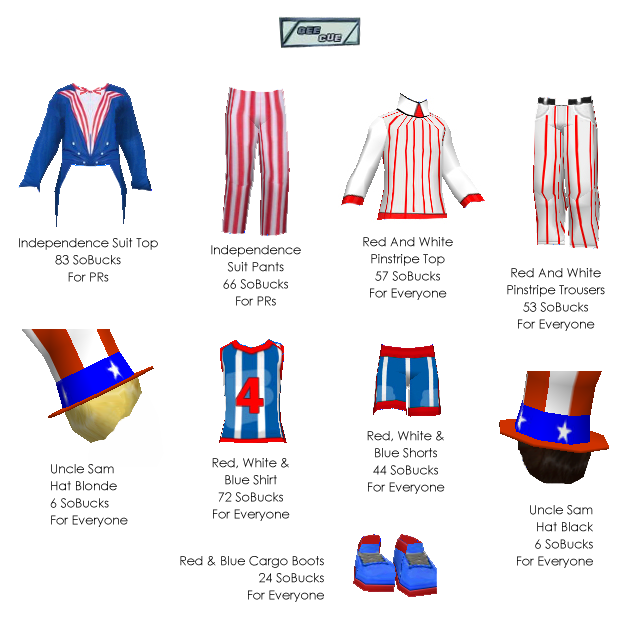 You can dress up for the occasion, too! Have you heard of Chris’ new announcement? It’s now a lot easier to buy a Permanent Resident subscription! 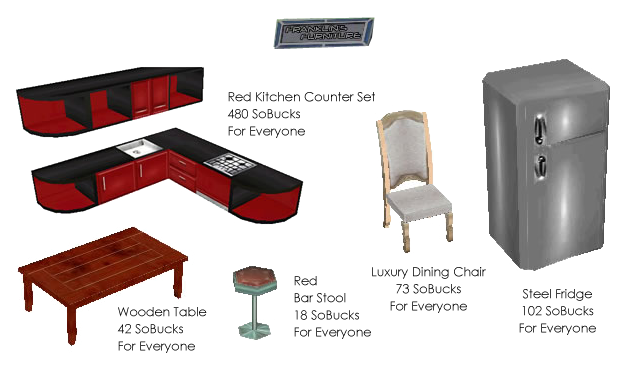 And to celebrate, SocioTown’s Weekly Shopping Guide is featuring these well-designed and must-buy PR items. So, old and new Permanent Residents, rejoice! 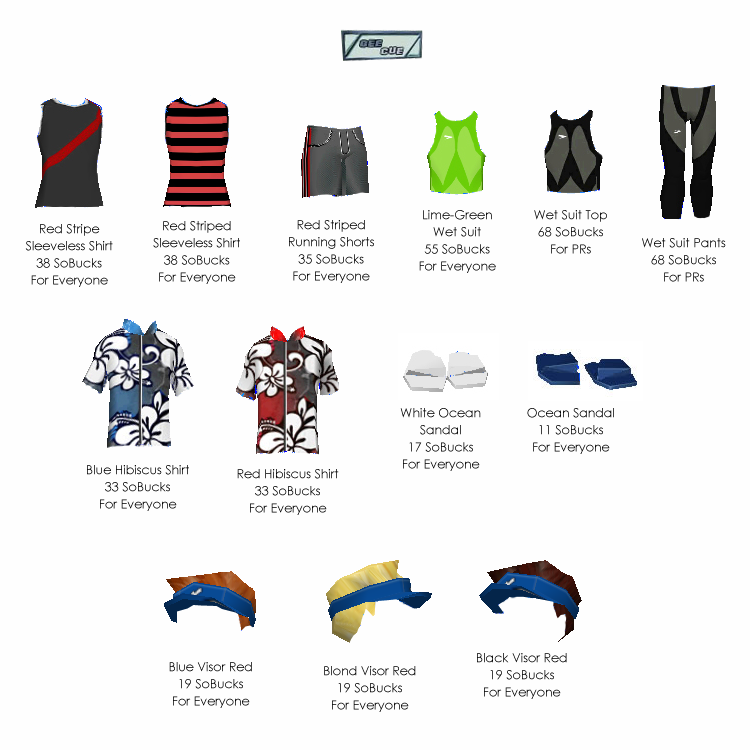 Try these items for an awesome PR experience. 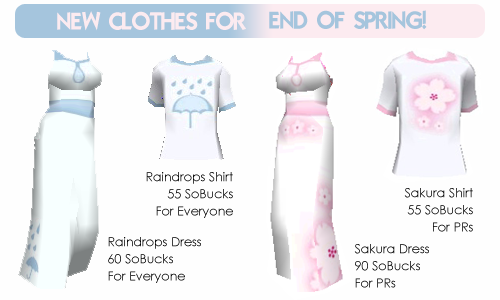 The Sakura Dress, Raindrops Dress, Sakura Shirt and Raindrops Shirt are available in the stores once again, due to numerous requests. If you haven’t bought one already, better head to the stores this week! 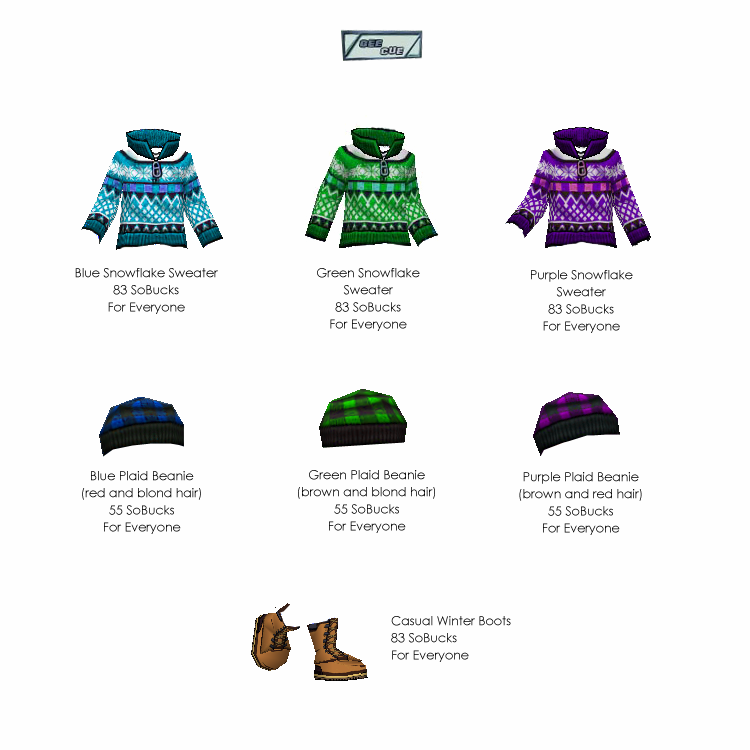 If you missed an item, comment below and I can try to have the item in the stores again this weekend. 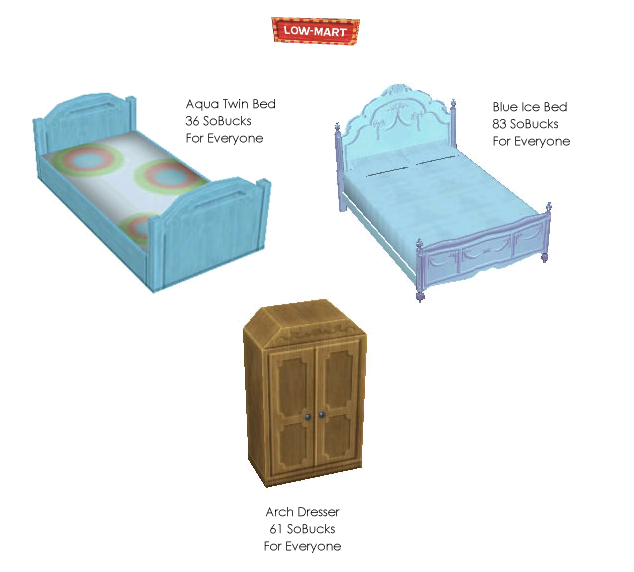 Low-Mart will have part two of its bathroom bonanza! 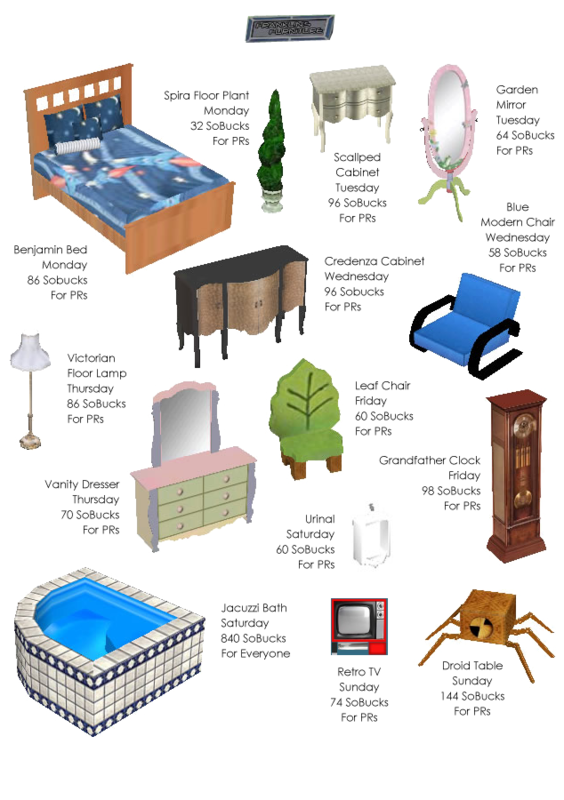 Visit it this weekend to see bathroom items. 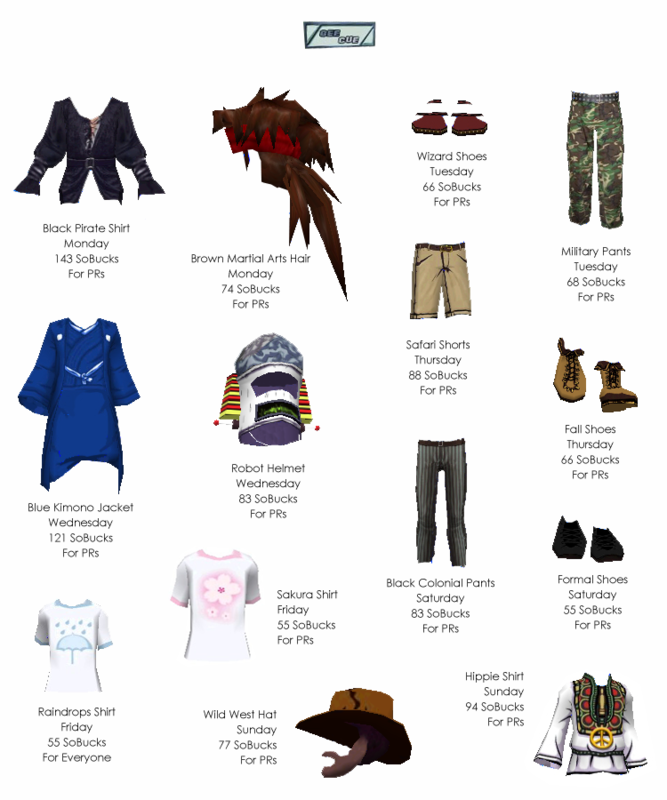 Weekend Shopping Guide : End of Spring! These will be available at Trendiiz and Gee Cue. 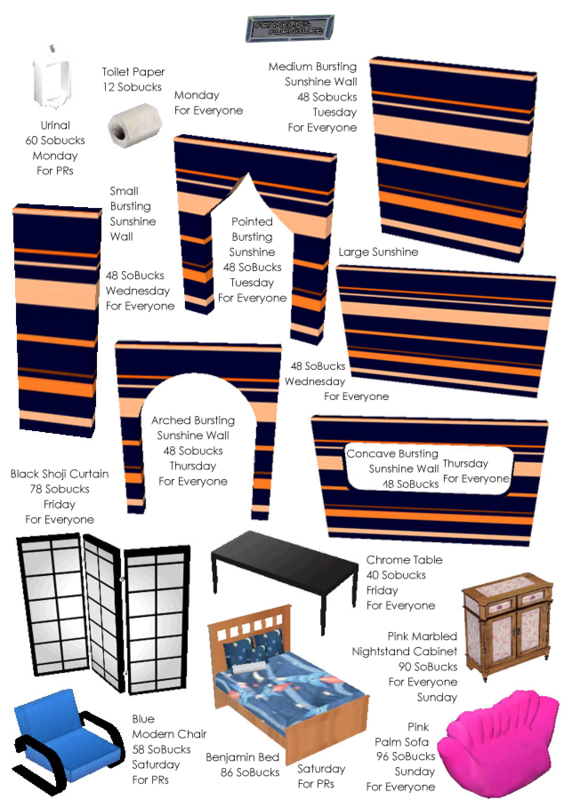 Furniture items will be posted tomorrow; if you’ve been planning on adding a new bathroom in your apartment, then tomorrow’s Franklin’s feature will be perfect for you. 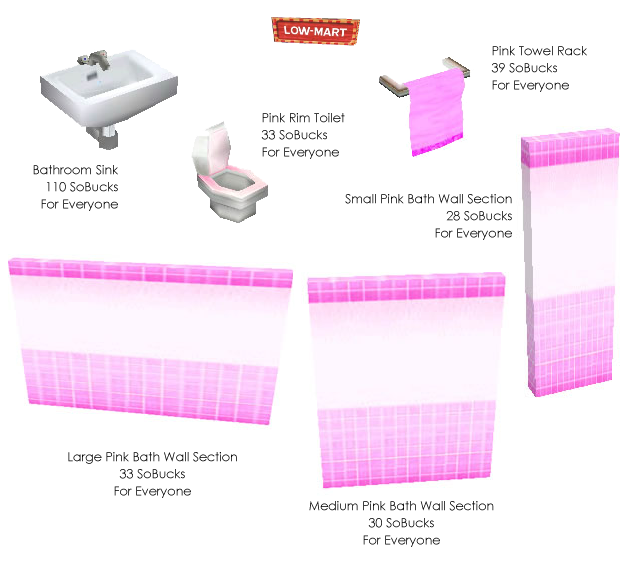 Update: Bathroom items are here! Plus, a brand new painting!! 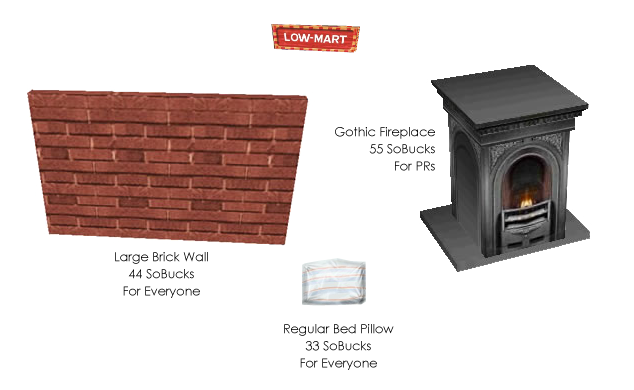 Bathroom walls can be bought at Low-Mart, while the rest of these items are at Franklin’s Furniture. 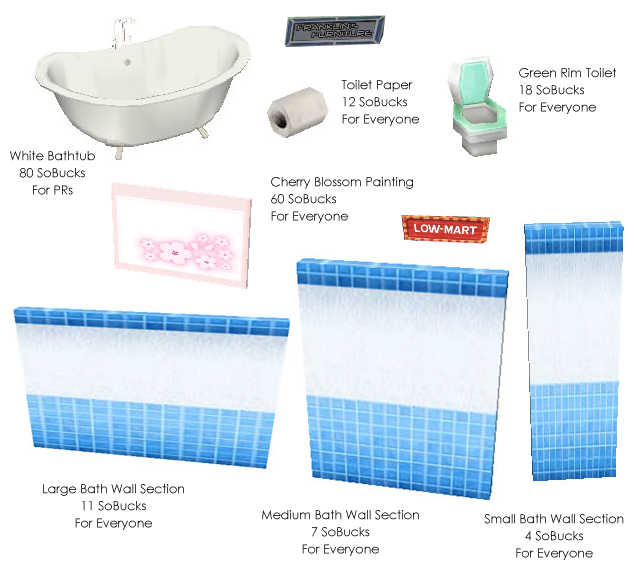 More bathroom items will be featured next week. 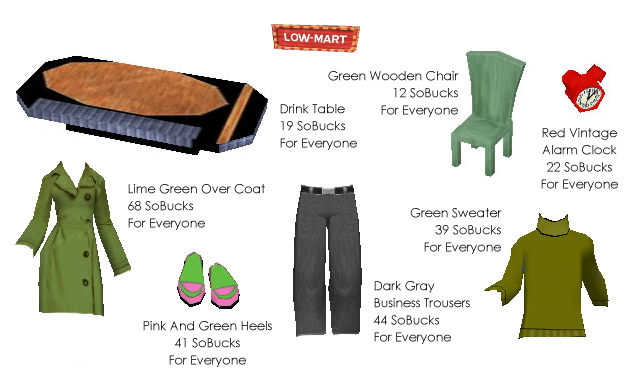 Buy, Snap and Earn: Buy one of these outfits, snap a screenshot of you wearing it, and share it in SocioTown’s official Facebook page to get a shopper’s reward of 20 SoBucks!